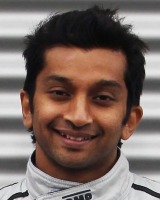 India's first F1 driver, Narain Karthikeyan joined Jordan in 2005 after 12 seasons in the junior formulas. He got the drive with the backing of Indian sponsorship, just after the team was bought out by the Midland group, and came to the sport with high hopes being dubbed "the fastest Indian in the world". At the time he said: "I've got the hopes of a nation behind me so I've no choice but to succeed now". He out-paced his team-mate Tiago Montiero early in the season but missed out on a podium at the farcical six-car race at Indianapolis and finished fourth - his best result. He was dropped by the team at the end of the season after stories of bitter rows with team boss Colin Kolles. He subsequently tested with Williams and represented his country in A1 GP, and in 2009 he finished seventh at the Le Mans 24 Hours with ex-boss Kolles' team. In 2010 he started to carve a career in NASCAR by taking part in the Camping World Truck Series, with a highest qualifying position of ninth and a highest race finish of 13th. In 2011 there were more than a few raised eyebrows when he was signed on a one-year contract by HRT, although backing from Indian car giant Tata to drive in the year of the inaugural Indian Grand Prix explained much. He did little to harm his reputation - although he was regularly beaten by his team-mate Tonio Liuzzi - until HRT replaced him with the Red Bull-sponsored Daniel Ricciardo after nine races. He returned for a one-off drive in Delhi and will have felt a degree of vindication as he duly beat Ricciardo. It was a performance that impressed the team, and as it searched for more money to partner Pedro de la Rosa in 2012 Karthikeyan regained his seat. Second time round Karthikeyan got a full season for the team, but funds were running out and his Formula One career appears to be over after HRT closed its doors having failed to find a buyer ahead of the 2013 season. With a career dating back to 1993, Karthikeyan has plenty of racing experience. The only problem is that just a single year of his career was spent in any kind of competitive F1 machinery and he struggled to impress. Winning races for India in A1GP. Losing his race seat at Jordan in 2005 after a difficult season. "I never even approached [Vijay] Mallya. The vibes from the camp have been extremely negative and I want to make it clear that I am not interested in driving for Force India." "I've always maintained that my time in F1 was not over and now making good on that promise." Karthikeyan's father was a rally driver in India. He won the South India Rally seven times in his career.